For a young man who rebelled at age 16 because he felt that he was being shoe-horned into a university place he did not want, Tom Meredith has proudly demonstrated that you don’t have to go to university to succeed by winning Coventry and Warwickshire First Young Professional of the Year 2017. The competition in the Financial Services category was extremely tough and was a true showcase of the region’s most talented young professionals. At an awards ceremony at the historic St Mary’s Guildhall in Coventry, Tom was presented with his award after being selected from a strong line-up of four short-listed entrants. Entries are judged on performance at work, contribution to Coventry and Warwickshire and the “x-factor”. 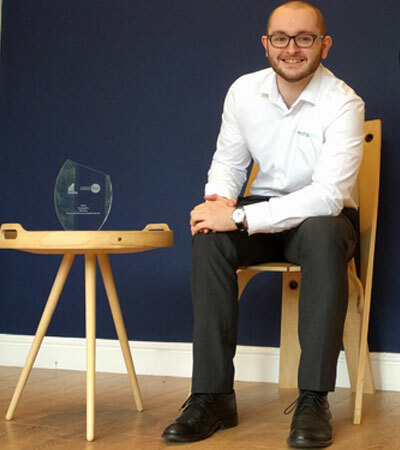 Having rejected the university path, Tom started with MarchantCain Design as a business administration apprentice through Coventry and Warwickshire Chamber Training. He swiftly completed his apprenticeship having, after just six months of basic training, enrolled on a self-taught programme with the Chartered Institute of Management Accountants with the goal of becoming a Chartered Global Management Accountant as quickly as possible. To date he has passed 14 examinations and is at diploma level already. Tom has become, through his incredible ability to teach himself the complexities of management accounting, and apply them in a fast moving business, an extremely valuable employee. Not only does he provide management accounts he also manages the IT and has so far managed all the purchasing function single-handed. He has grown in confidence to the extent that he now manages all financial matters within the company including negotiations with investors and suppliers whilst keeping a very close eye on purchasing. If only all apprentices could be like Tom. But we know that he’s a one-off. Just got to make sure that we give him every opportunity to progress and somehow we hang onto him.